We have discovered 11 functional gems hidden in the platform. They are small, yet decisive in bringing your Email Marketing activities to an advanced level. Creation, sending, and reporting. These are the functional macro-areas par excellence of an Email Marketing platform. However, nestled among these three MailUp segments lie decisive tools and functionalities that can give your strategies an edge. In the shadow of the most used tools, we want to dedicate this post to these little functional gems. We have identified 11. Let’s start. This is a valuable function to ensure that the links included in the email are intact and do not affect the performance of the campaign. This answers the question: “Are my email links okay or blacklisted?” Knowing this is crucial, because a blacklisted link is a strong signal of both message and sender unreliability to the ISP and spam trap. There is nothing worse than linking to an error page. Wrong links compromise a campaign, disappoint the recipient, and undermine the brand’s reputation. MailUp runs the link analysis and tells you if the corresponding URL is correct or not. Where can you find the function? Very few people know this: you can use automatic mailings to create a rule in the automatic segmentation platform. This is easier to explain through an example: you can automatically move recipients from their own group to another ad hoc-created group 15 days after the last click or opening. In doing so, you will find a group of already-segmented recipients on the platform in which you can communicate and send targeted campaigns. Perhaps you already know that MailUp makes available a wide library of API and integrations. It is worthwhile, however, to dwell on a precise connector: Zapier, which helps various applications communicate with each other. Zapier makes it extremely simple to “do something” in an app whenever “something happens” in another application. Upon arrival of a new order, the MailUp list can be updated to send the purchase confirmation to the customer. Every new member of the “monthly promotions” MailUp list is added as a CRM contact. And vice versa. During events, it is possible to manage different ticketing activities (purchases and related notifications) by coordinating MailUp with a service like Eventbrite. Customer care can manage the relationship with customers and potential clients by synchronizing Email Marketing with external services and platforms: we at MailUp manage, thanks to Zapier, all the activities related to NPS. Because of Zapier, the possibilities of connecting two different applications are almost endless. It is called Calendar mailing, and it is the section that allows you to have a panoramic and organic view of all the communication plan campaigns. It is transversal to all lists so that you can globally consider all mailing categories. Yet it still allows you to filter the scheduled launches and whether or not to authorize the visualization of the scheduled campaigns. Custom rows represent one of the major projects we have worked on this year. It includes content uploaded through sources (via RSS/Atom feed or CSV, Json, Zip files), made immediately available in the BEE editor in the form of content blocks. The various content will appear in the right-side menu. It will already be formatted with a predefined layout. To insert a custom module, just drag-and-drop it inside the body of the email. Once inserted, the content’s text and images can still be modified. In this video you will find an initial presentation of the customized modules. 6. Did you know that you can manage administrators in a granular way? Additional access to manage and restrict entry into specific work areas and platform functions. Thanks to a main administrator, it is possible to further manage differentiated and independent permissions (viewable environments, menu items, functions, and more). In accordance with GDPR, the new European regulation that oversees the processing of personal data for its protection and management of particular categories, the MailUp platform allows you to modify the privileges of the various associated users and manage the visibility of hidden fields. BEE allows you to add video content to messages without having to enter an embedded code, thus solving all the exposed problems. To insert a video into the creative, simply copy the URL of the uploaded video to YouTube or Vimeo and paste it into the video block. BEE then automatically takes care of retrieving the video preview by inserting it into the template using the cover image and entering the “play” button. You have probably noticed that BEE fits email content for mobile viewing. The operation that the editor carries out is always the same: unlock any content grids and line up the modules. On the contrary, often it is a necessity to ensure that the original arrangement of the email is maintained, and that the contents are not lined up when the message is opened from a mobile. 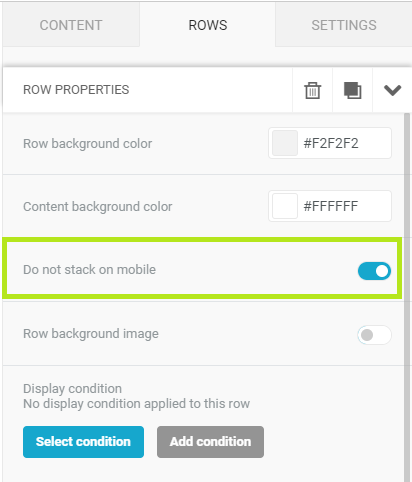 Here, MailUp gives you the possibility to choose whether to line up each content row on a mobile or not. Simply select or deselect the item in the right column, moving the mouse above the row of interest. Before sending, it is essential to check the compatibility of the email with the main mail clients. To support you on this, a specific MailUp function verifies the yield of your email on 76 mail clients, including smartphones and tablets. In just a few minutes, you can see how your message appears across multiple devices, simulating scroll and screen rotation. Collaboration is a tool that we launched last year. It is very useful because it facilitates and makes creation operations immediate as well as shares and approves email-related projects. When several heads work together on an email campaign, the result can be a lot of confusion on views and comments. With Collaboration, the process becomes linear, fast, and error proof. Share the email by entering the email addresses of the people you want to involve, sending them an invitation to collaborate. Collect feedback related to texts, design, or a call to action. These are incorporated by your collaborators in the form of notes and comments by just clicking on the email. Prepare the launch. Once the final version is defined, mark the email as resolved. The Preference center is a MailUp platform panel that functions as a webpage where your contacts can land to complete and update their profile independently and at any time. User activity (email openings, clicks, device used, and geolocation). These are just a few examples of use. Reference to the Profile Management Center can be molded to any need. 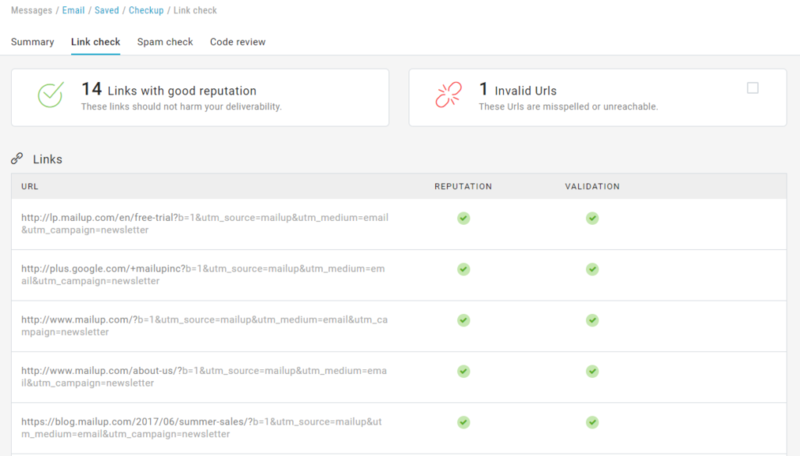 As you may have understood, MailUp is not a tool but a platform that holds a set of functions organized for operational areas of Email Marketing: database building, message creation, profiling, segmentation, sending, tracking, and much more. The advice is to try it if you have not already done so. Become familiar with the functions and understand how to improve your Email Marketing strategies.